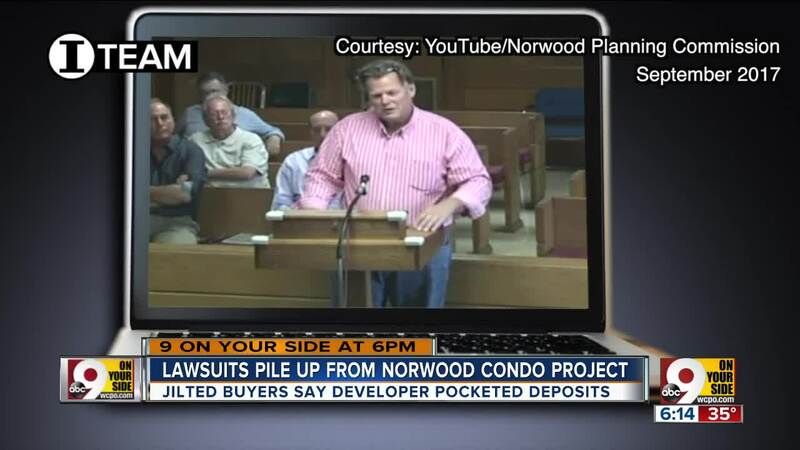 Jilted buyers said a developer pocketed their deposits. In September 2016, Scott Byron Call claimed to be indigent. Twelve months later, he claimed to be capable of financing a $12 million condo project. “We have actually commitments to finish the first phase,” Call told Norwood Mayor Tom Williams in a Sept. 6, 2017 public hearing for Legacy Lofts. Call described for the Norwood Planning Commission a captivating plan to tuck 112 affordable condominiums into the century-old Norwood Baptist Church and three vacant schools along Courtland Avenue. But now Call’s history includes a trail of broken promises that spawned five lawsuits and left more than a dozen people struggling to reclaim the $5,000 “fully refundable” deposits he required to reserve certain units. “He’s a liar. He cheats. He tells you promises,” said Monica Brown. The Colerain Township woman has been trying for more than a year to recover two deposits on behalf of her son and a family friend. Courtney Hausfeld said Call seemed trustworthy at first but grew increasingly evasive as months passed with no progress on the building. In telephone interviews and in written responses, Call told WCPO that he intends to return all deposits. But he’s also incorporated a new company in North Carolina, which makes Brown worry that he’s trying to do in Raleigh what he did in Norwood. Call’s attorney, Brian O’Connell, said Call has repaid about $15,000 of the $75,000 in deposits submitted by 12 to 15 people. O’Connell, one of at least eight lawyers to represent Call here since 2016, said deposit money was spent on design fees and other project costs. O’Connell said Call is preparing to send $1,000 payments to all depositors soon with money raised from the assignment of a real estate purchase contract in North Carolina. Ohio law requires money from reservation deposits to be held in escrow unless there is a purchase agreement that specifies how it can’t be spent otherwise, said James Matre, a Sharonville attorney who has worked on condominium developments for more than 40 years. But being right is only half of the problem when chasing payments from developers, who can shift cash and assets between limited liability companies to frustrate collectors. Matre adds that disputes like this normally lead to civil litigation. But this case could be different. To get to the bottom of that question, WCPO spent several weeks investigating Call’s time in Norwood. We quickly established from public records and interviews that the stories Call told others were difficult if not impossible to confirm. For example, Call told Norwood’s Mayor he came from Florida. He told the Cincinnati Business Courier he developed projects in New England. A former customer said Call told him he’d worked in Chicago. His web site for Living Heritage Homes describes three previous projects but does not identify the cities where they happened. Searching for public records on Nexis, WCPO found previous addresses for Call in California, Arizona, Nevada and Texas. Not Florida, Chicago or New England. Court records indicate Call was evicted in 2014 from a home in Denton County Texas and ordered to pay $6,300 in damages. The address for that eviction was still on his drivers license when Cincinnati Police gave Call a traffic citation in April, 2016. Court records in Tuscon show Call faced five misdemeanor charges of passing bad checks in 2007 and 2008. All were dismissed. Hamilton County property records show Call never actually owned any of the properties that were part of the Legacy Lofts project even though he regularly entered those buildings to show prospective buyers floor plans, cabinet samples and negotiate purchase terms. Mayor Williams said he suspected Call would not be able to line up financing, but didn’t want to confront him directly because he didn’t have proof. “How do I say this diplomatically? I’m going to expect you to do what you say,” Williams asked Call in the Sept. 6, 2017 public hearing. “Outside of calling him a liar which I didn’t do, I sure raised the question,” Williams told WCPO. Call claims he actually did line up financing, but Norwood city officials “totally unraveled” his deal. In a two-page statement to WCPO, Call said “a sole private investor” agreed to loan the project $1 million and guarantee bank debt in September, 2017. He declined to name the investor. After Norwood approved a zoning change to enable the project in November, Call said the lender’s son told city officials “they had bought me out, they were now controlling the project and would look to do rental” units not condos. Call said the city threatened to block the project “if I went ahead with this lender” so he was forced to seek other financing. Mayor Williams confirmed that the city did not want Call to build apartments at Legacy Lofts, but denies that the city interfered with Call’s investor. He also confirmed that the city never did a background check on the Legacy Lofts investor. Monica Brown said Norwood should have done a better job of vetting its developer. She also thinks property owners should not have let Call enter their buildings until he actually owned them. Norwood City Schools declined to answer questions about its contractual arrangement with Scott Call. Norwood Baptist Church had little more to say. “Because we had a contract initially for him to buy the property, we gave him a room inside the church to set up as an office,” Pastor Roger Sheldon said. “From that point on, things didn’t work out the way we thought or he thought. So, it’s over. The matter is closed. I’d rather not talk any more about it. Brown admits she didn’t investigate Call’s background before her son signed a reservation agreement with the developer. Neither did Miller or Hausfeld, who both said they had a good feeling about Call during the sale process. Even if they had looked for local court records in 2017, there wasn’t much to find: One traffic ticket for failing to control his vehicle in Cincinnati, one dismissed charge for writing a bad check. It wasn’t until April, 2018 that an inquiring mind could have found the reason behind Call’s traffic ticket. That’s when Mount Healthy resident Richard Dukes sued Call over the accident that led to Call’s 2016 traffic ticket. Dukes alleged he was Call’s Uber passenger when his silver Cadillac SRX drifted left of center, striking an oncoming vehicle. The case is now in mediation. Portions of the bad check case were available in Hamilton County court records. But only in a Norwood police report did it mention that the check involved the Legacy Lofts project. Norwood resident Ruth Neace told police she invested in the project then asked for a refund, at which point Call wrote her a $5,000 check that bounced. Norwood pursued a felony bad check charge. Lt. Ron Murphy said prosecutors deemed the dispute a civil matter so the case was dismissed. That happened two months before Call signed a purchase agreement with Norwood City Schools, tying up for more than two years a property that the district put up for auction months earlier. The starting bid for that auction was $875,000. Each new revelation is another bitter pill for Hausfeld, who still wants to buy a home but delayed her search because she can’t afford a down payment. “I went to undergrad and graduate school. I have loans from both that I'm paying off for a long time. I need this money to help me put down a down payment on a place,” she said. “So, $5,000 might not seem a lot in the grand scheme of things but its, you know I can do a lot with $5,000, with the payments I'm paying off right now." Matre said those who lost money on Legacy Lofts will have their best chance of getting their money back if Ohio Attorney General David Yost adopts their cause by initiating civil or criminal proceedings on their behalf. Although he hasn’t formally requested it, Mayor Williams said he would like to see a criminal investigation of Call’s activities in Norwood. No one has contacted the Ohio Attorney General’s consumer complaint hotline about Legacy Lofts, said Beth Gianforcaro, deputy director of communications.